You asked for it, so here it is: our fourth annual West Coast favorite sources. This year’s list not only includes local architects’ most dependable consultants, contractors, products, and suppliers. It also includes many of our best projects from the last year. It’s a list that we’re especially proud of, and we think it will help architects be prepared as they continue to recover from the Great Recession and actually begin to build again. Below is a sample listing from AN's annual West Coast best of issue. Additional categories include Engineers, Kitchen / Bath, Consultants / Services / Suppliers, Materials, Sustainability, Lighting, Glass, Fittings / Furniture, Curtain Wall / Door / Window. If you would like to purchase a full print edition of this feature, please contact The Architect's Newspaper at 212-966-0630. Jaqua Academic Center, Artemide, ZGF Architects. Phoenix Biomedical Campus Health Sciences Education Building, DPR CONSTRUCTION, sUNDT CONSTRUCTION, Co Architects. 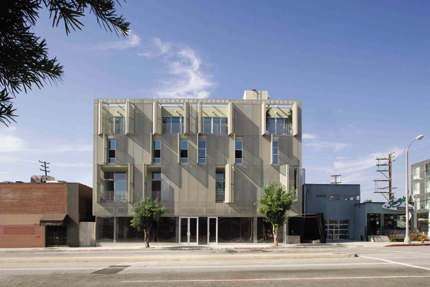 AC Martin's Hollenbeck Community Police Station, one of 15 projects included in the Biennial's architecture category. The museum also added architecture to the mix for the first time, with 15 projects selected by Frances Anderton, host of KCRW’s DnA: Design and Architecture. Her thoughtful choices amount to the biennial’s most impressive category, setting a standard that the other curators struggled to match. As you might hope from a “best of” exhibition, each of the buildings on display—through large prints, drawings, and models—embodies outstanding formal and material design values. 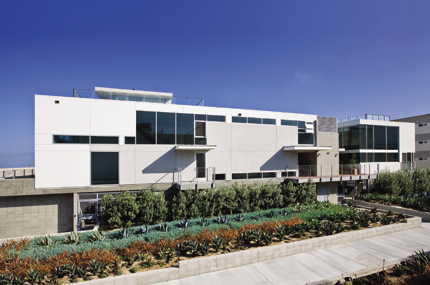 More important is the fact that projects such as Michael Maltzan’s Inner-City Arts complex and Frederick Fisher’s Annenberg Community Beach House apply their California modern styling in the service of a highly contextual solution. In Maltzan’s case, the combination of dazzling white walls in a Skid Row site makes a deliberate statement about trust and commitment. Meanwhile, Fisher’s minimalist clean lines are used to frame, rather than overwrite, the site’s evolution from historic luxury mansion to public amenity. 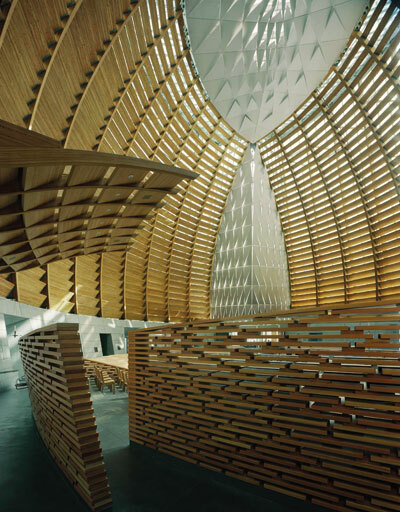 SOM's Cathedral of christ the light, also a featured project. 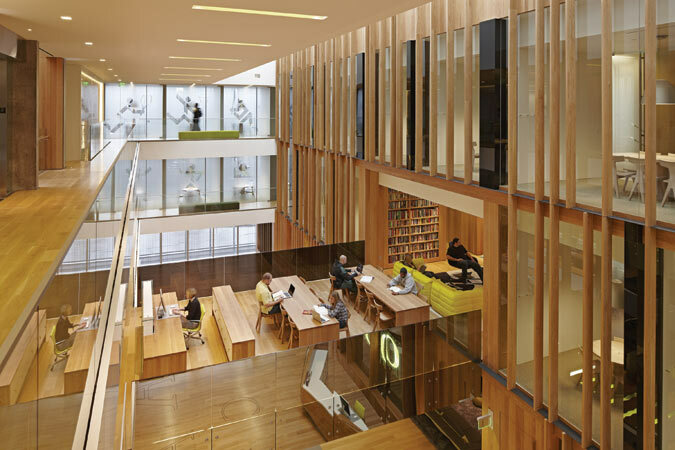 But beyond their aesthetic charms and site-specific design solutions, Anderton’s choices reveal the transformative potential of architecture—those rare instances where a single building can utterly change our perception of a place. Perhaps the most striking example she provides is the Baldwin Hills Scenic Overlook by Safdie Rabines: a polished concrete, butterfly-roofed pavilion whose sleek but understated presence provides the perspectival shift necessary to recognize this scrubby, unfinished landscape of oil wells and cell-phone towers as a perfectly Angeleno urban park. Lisa Little and Emily White of Layer’s Fat Fringe—a temporary canopy of die-cut paper—seems peculiarly out of place alongside these socially and environmentally responsive projects. 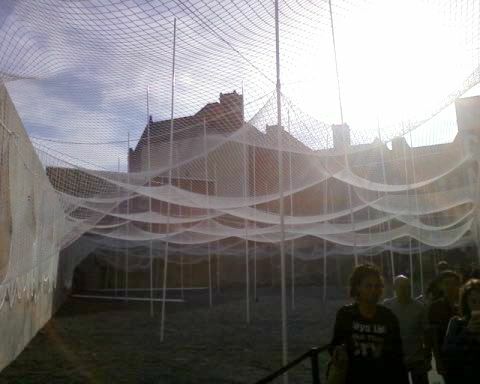 Anderton explains its inclusion as the lone representative of a strand of iterative, process-focused material explorations by a new generation of Californian architects, including the fantastic lace and string experiments of Atelier Manferdini and Ball-Nogues. Of course, complaining that a design biennial is uneven somewhat misses the point: More than half the fun of these kinds of grab-bag exhibitions lies in the treasure hunt, as visitors single out their own aesthetic highlights and thematic convergences. On that basis, the show is an indisputable success. There is, quite simply, gorgeous and thought-provoking design on display. The fashion design category, curated by Rose Apodaca, all but ignores the stated theme of the biennial in favor of a single-minded focus on wildly expensive and idiosyncratic examples of craftsmanship. Nonetheless, Koi Suwannagate’s hand-sculpted cashmere, and Raven Kaufman’s beetle-carapace-encrusted accessories, are breathtaking, both in terms of their visual impact and as physical manifestations of thousands of hours of artisanal labor. Stewart Reed’s transportation design selection, while equally unengaged with the biennial’s central question, is much less successful. Admittedly, its most striking inclusions—the Virgin Galactic SpaceShip2 and the Seabreacher, a dolphin-shaped submarine—are poorly represented by diminutive photos. Still, it is hard to find much to marvel at in a bicycle whose sole recommendation seems to be that it is 2 percent more aerodynamically efficient than its rivals, or BMW’s Bavaria Deep Blue 46, which is nothing more than a nice-looking luxury yacht. Curiously, the biennial’s most provocative idea emerges from its most chaotic sections—product design and graphic design. Tucked in between underwhelming choices, such as a handful of low-cost Heath tiles and the California College of the Arts’ recycling decision-maker, are a couple of intriguing projects that rethink the role of the designer altogether. IDEO’s Human-Centered Design Toolkit is a free guide created to help nonprofits do their jobs more effectively, while Twitter’s retweet functionality was designed by its user base, who were in turn empowered by the platform’s deliberate flexibility. Although the former is classified as graphic design and the latter as product design, they actually share a transdisciplinary approach that reimagines design itself as a process that facilitates innovation, rather than as a specialist craft. This vision, in which the designer willingly cedes tools to others while vastly increasing the discipline’s remit to include systemic problems, is the most intriguing response to contemporary challenges on offer at the biennial—a reaction that results in much more effective action. 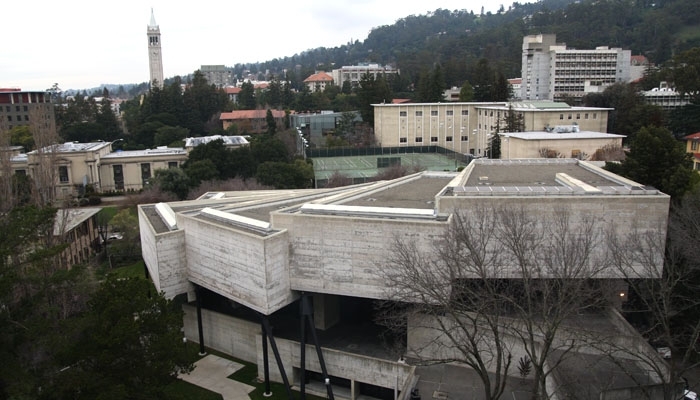 Mario Ciampi's original Berkeley Museum, which has been deemed seismically unsafe. The envelope of secrecy around the SFMOMA expansion has yet to be lifted, but the three contenders for the Berkeley Art Museum/Pacific Film Archive’s new home were announced earlier this week. Two are well-known names, Diller Scofidio + Renfro and Tod Williams Billie Tsien, responsible for two of the most notable art museums of the last decade—the Institute of Contemporary Art in Boston and the American Folk Art Museum in New York. These two firms were also in the original pool that BAM/PFA considered for its original, ground-up design, which was won by Toyo Ito and subsequently scrapped for budgetary reasons. The third name in the running, Ann Beha Architects, is not as familiar. But the firm has several museums to its credit, including two that involved additions to historic buildings: the Portland Museum of Art in Maine and the Currier Museum of Art in New Hampshire. The firm is also known for its careful transformation of Boston’s 1851 Charles Street Jail into a luxury hotel. The remaining seven of the 10 asked to present qualifications were: David Adjaye, Will Bruder, Frederick Fisher, Michael Maltan, Snøhetta, Bernard Tschumi and Rafael Viñoly. The winner will be collaborating with EHDD, who will be the architect of record. 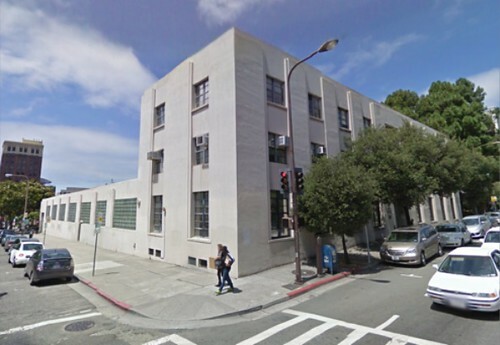 The project involves the adaptive reuse of a 1939 printing plant on Oxford Street, near the entrance to the UC Berkeley campus. The plant has been vacant since 2005. A three- to four-story addition alongside the older structure, providing an additional 50,000 square feet of gallery space, offers the opportunity for new architectural design. The overall budget, hard and soft costs included, is around $85 million, less than half of the $200 million estimated necessary for the original design proposed by Ito. The winner is expected to be announced at the end of June, and the building is anticipated to be completed by the end of 2014. A. Quincy Jones turned a Century City building inspired by New England farm architecture into his home in 1965. It seemed for a time that A. Quincy Jones’ beloved “barn,” which the architect used as his home and studio, might be put out to pasture when the house went on the market in 2008. But The Architect’s Newspaper has learned that the building has been saved through a recent purchase by the Metabolic Studio, an arts program affiliated with the Annenberg Foundation. 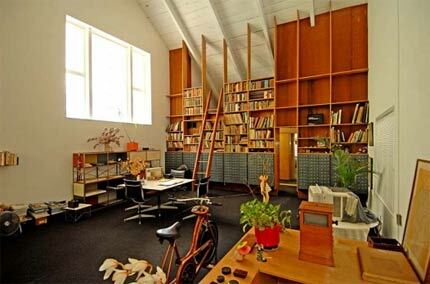 The studio is working on a minor renovation with Frederick Fisher that will do much to maintain Jones’ unique interiors. Later this year, Chora, an arts incubator, will move in, with offices and an artist-in-residence program occupying the space. Located in LA’s Century City, the structure is Jones’ redesign of an old photographer’s studio that was modeled on a New England barn. Jones completed his transformation of the property in 1965. The large, open space has 50-foot-high ceilings, large sliding doors, a pitched-roof, redwood paneling, Jones' typically elegant built-in cabinetry, and carefully-oriented windows that allow rich light to flow in from several angles. The main room in Jones' house makes it clear why the building is known as the barn. While the Exterior may be atypical of the designer's high modern work, the interior is a hallmark of it, all clean lines and exacting details. The studio, which closed on the property in November, would not disclose the price it paid for the house. The previous owner was Jones’ widow, Elaine Sewell Jones, who stayed until the end of 2009, 30 years after the death of her husband. "Not one single person who knew Quincy thought he'd ever buy a New England barn, but he made it his own," Sewell Jones told the LA Times in 2002. The renovations will not change the barn structurally or aesthetically, but will consist of “cleanup and stabilization,” said Fisher, who also designed the Annenberg Community Beach House in Santa Monica. Fisher stressed that he will make every effort to respect the original, much as he did with Jones’ former offices out of which his firm now works. “We’re using a very light touch,” Fisher said. Work includes updated lighting fixtures, window upgrades for sound and thermal insulation, and new ventilation systems. “The place really felt like you had stepped back in time," Fisher said, and he said he intends to keep it that way. Jones' study, like most of the barn, enjoys with high ceilings and ample light. Chora is a project of the Metabolic Studio, which is run by Annenberg Foundation director Lauren Bon and gained notoriety for its “Not a Cornfield” project. 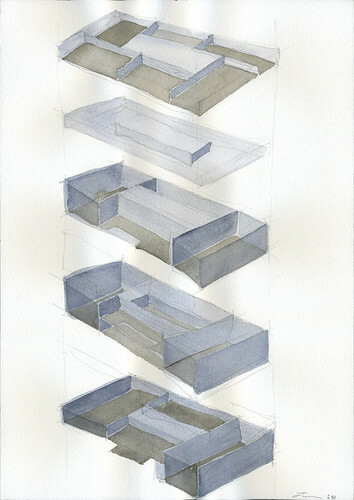 Chora's offices will take over the barn’s small studio later this year, and its first artist-in-residence should be moved in by the fall. Chora also plans to use the space for lectures, exhibitions, and events, In addition to the new artist-in-residence program, Chora provides grants and an annual prize to artists. Bridget Kelly, a program associate at the Annenberg Foundation, said the barn was chosen in large part to lend inspiration to visiting artists. “You walk in and you just are in awe of every detail,” she said. Another reason for the choice: Jones has a long history with the Annenberg family. 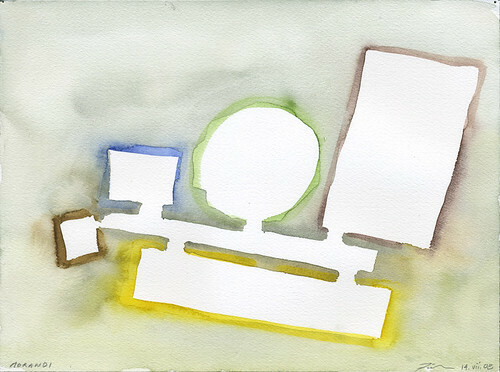 He designed Sunnylands, the Annenbergs’ Palm Springs estate—Metabolic Studio’s Bon, who is Walter Annenberg’s granddaughter, grew up visiting the compound—as well as the Annenberg School of Communications at USC. The barn has Jones' built-in fixtures throughout. The decision to restore the barn also fits nicely with the Annenberg Foundation’s practices, as it has made historic preservation a top priority. In addition to renovating the barn and transforming the Marion Davies pool and guesthouse into the Annenberg Community Beach House, the foundation is converting the landmark Beverly Hills Post Office into the Wallis Annenberg Center For The Performing Arts. 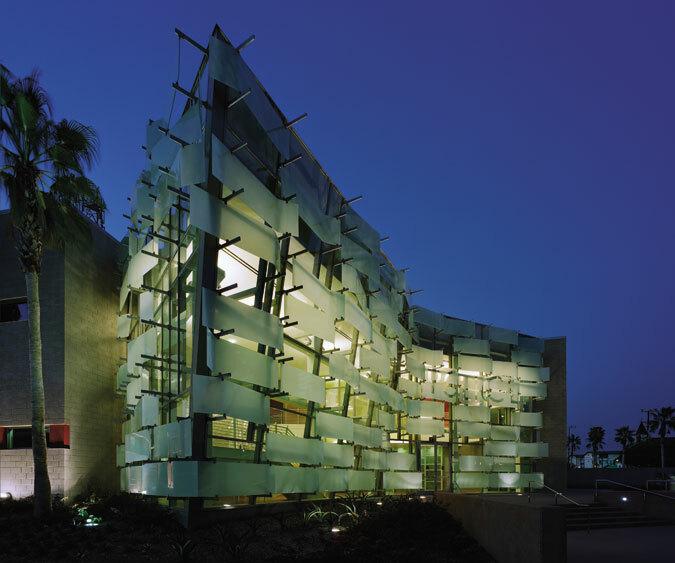 Aleks Istanbullu Architects' 1200 Sweetzer in West Hollywood. The Great Recession may have value if it shakes the belief that a single-family house and backyard is the fulfillment of the American dream. Millions of families have bankrupted themselves in pursuit of this trophy, while suburban sprawl has drained energy from city centers, increased global warming, and gobbled up land that might have been used for recreation, farming, or open space. As cities continue to grow, we need to learn to cluster more tightly together, encouraging architects and planners to enhance the quality of urban living. Luckily, architects are responding to the need to expand inward and make better use of scarce resources. In Los Angeles, infill condo blocks have multiplied in the progressive neighborhoods of West Hollywood, Santa Monica, and Venice, typically substituting eight to 15 compact units for one or two tear-downs. The best of these occupy the middle ground between the single-family communities that were first developed in the 1920s and the bland, overscaled apartment towers that often followed. At their best, they offer high-quality design and livability, as much space as most people need, plus sustainability and low maintenance, all at an affordable price. It’s the Prius versus the Hummer. 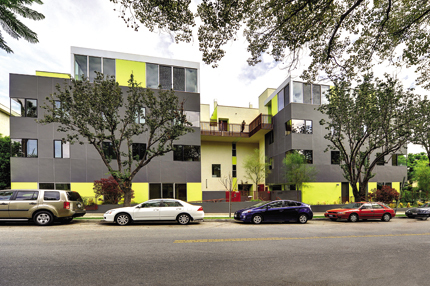 Several LA firms have specialized in multi-unit housing. 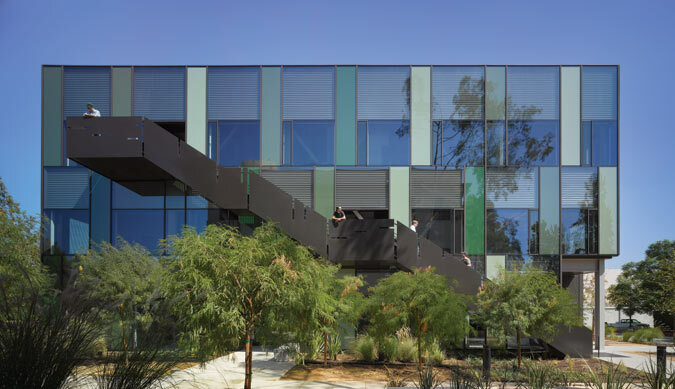 Pugh + Scarpa, which just won the National AIA and AIA California Council Firm of the Year awards, claims to have designed as many as thirty condo blocks. Lorcan O’Herlihy Architects won acclaim for Habitat 825, which took its cues from the landmark Schindler studio house on the adjoining site, and several other innovative infill blocks. 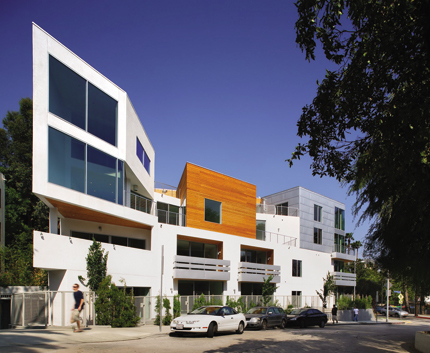 Koning Eizenberg Architecture were pioneers in creating low-cost infills in Santa Monica, and Frederick Fisher, Kanner Architects, and SPF:a have also done exemplary work. Like the following projects, they all draw on a rich local legacy of multiple housing. Spanish-inspired bungalow courts in West Hollywood are coveted properties. Gill’s Hollister Court, Schindler’s Falk Apartments, Ain’s Dunsmuir Apartments, and Neutra’s Strathmore Apartments are among those architects’ finest achievements. The tradition was ruptured in the 1970s, but a new generation has reinvigorated the idea in response to a growing demand for fresh solutions. As always, large developers and builders lag far behind, stubbornly clinging to stale formulas and degrading the communities they exploit. A classic confrontation is shaping up in North Westwood Village, where Dallas-based PPC wants to squeeze a banal five-story rooming house—a warren of tiny rooms with inadequate parking and open space—onto a narrow triangle of land. It could overwhelm pedestrians and the Strathmore Apartments (where this author lives), an LA Cultural-Historical Monument that steps back up the hillside. Meeting a need for professional and faculty accommodations near the campus, Barton Myers Associates has proposed an intelligent mix of studios and townhouses that respects the topography of the site and the character of the neighborhood. The BMA proposal is a model, as are five recently completed developments that also put people ahead of profit and create intimate livability on a scale that is more sustainable than the single-family model. John Chase, the planning director of West Hollywood, has weaned the community away from a Truman Show addiction to cute revivalism, and encouraged it to embrace contemporary design. With his support, architects and developers have created a succession of bold, urbane interventions. 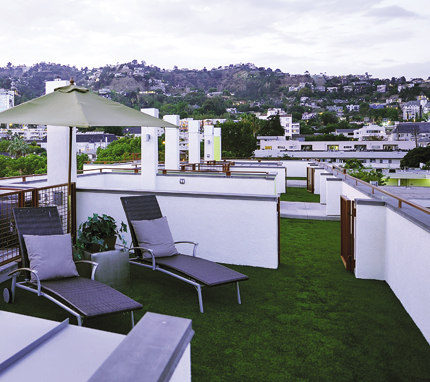 Istanbullu, who has designed upscale residences in the Hollywood Hills, has brought that same emphasis on quality to a cluster of ten maisonettes on the flats. 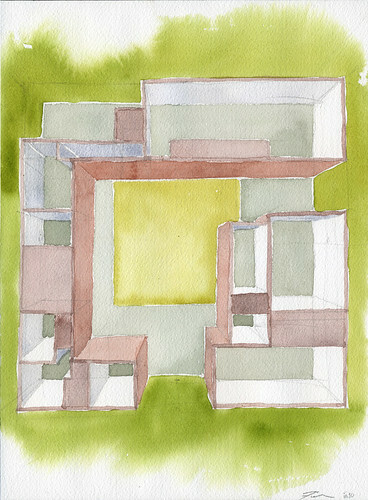 Stacked duplexes are articulated with color: chartreuse stucco clads the expansively glazed living areas at top and bottom; gray covers the sleeping areas sandwiched between. The goal was to give each house its own character—a stepped loft was inserted over the ramp to basement parking—opening up to landscaped space. Color and dense plantings dematerialize the mass, and windows on three sides of each living space pull in fresh air and views to lofty open plans. The three apartments to the rear have stairs leading to rooftop terraces that are covered in artificial turf and separated by low walls. There, gazing out over the city and up to the hills, you can imagine you are in a private oasis. Nick Hertz of Urban Moments was the developer, marking his first foray into this field. 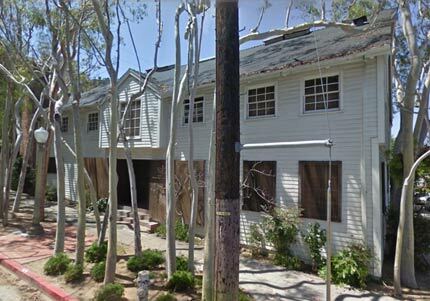 Eight row houses are squeezed onto three irregular lots just south of Abbot Kinney Boulevard in Venice. The complexity of planning ordinances and the 50-foot depth of the lots discouraged building, but developer Rick Erhman saw an opportunity to exploit the location. Six identical row houses, plus a separate block of two, are crisply articulated, giving the complex a strong presence. Sloped shed roofs of copper that evoke mansard roofs canopy the entrances and enclose stairs and services. Ehrlich is best known for his indoor-outdoor single-family houses, and he has achieved the same quality here by putting living areas above the garages and using roll-up garage doors to open up the interiors with no sacrifice of privacy or security. The glazing grid and translucency of the garage doors evoke shoji screens, as do the upper-level doors when blinds are drawn. Stairs run up the sides of each unit, with a small office or guest room behind, to a lofty second floor and mezzanine wrapped around on two sides. The development mediates between commercial and residential zones, contributing to the densification of Venice without overwhelming its small-scale neighbors. That makes it a model for dynamic communities that want to preserve their character. This project is a split 12-unit block that replaces the legendary Cherokee Recording Studios, which were built by Frank Sinatra and hosted many other notable musicians. It has a tough urbanity that respects the scale of its eclectic neighbors on busy Fairfax Avenue. The ground floor is given over to a fully glazed retail space with surface parking behind, and the three upper levels are wrapped in a perforated metal skin with manually operable shutters opening onto recessed balconies and narrow windows. The skin shields residents from the sun and provides a thermal barrier; the recesses have bold color accents. Laminated glass sliders protect the units from traffic noise. Entry to the apartments is through a second-floor courtyard, with stairs and an elevator leading to the upper-level living areas of the seven town houses. Acoustically insulated recording studios are incorporated into two of the larger units in a nod to the history of the site. A shared roof deck offers 360-degree views and is clad with photovoltaic panels to the south and east. The architects are seeking a LEED Platinum rating, which would be a first for multifamily, multiuse developments in southern California. It’s a debut for Rethink Development of Culver City, whose co-director, Greg Reitz, was formerly the Green Building Adviser for the City of Santa Monica. 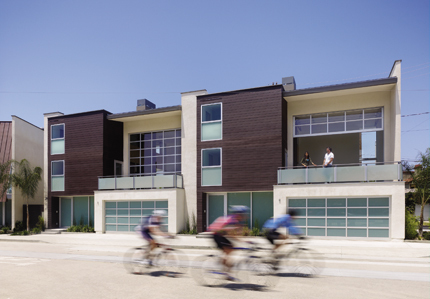 Clive Wilkinson’s nine two-story town houses are located on a triangular lot at the corner of Franklin and Las Palmas, which leads up to Whitley Heights. Local residents wanted an ersatz Spanish building to complement their historic neighborhood, ignoring the eclecticism of the immediate surroundings. The architect has given them something much more interesting as a symbolic gateway, exploiting the angularity of the site with a sharp prow and a strong feeling of openness. The white stucco exterior is partly clad in Galvalume paneling and cedar wood siding to break up the mass and articulate the separate units. Each unit has 20-foot ceilings in the living area, which extends through the site for views to the west through expansive windows and a protected entry court to the east. There are private balconies and yards and a shared roof terrace. Each unit has a distinctive character: a freestanding steel staircase in one, another with an upper-level bridge linking the main living room and a more enclosed space. Bath-service cores provide a retreat within expansive, transparent volumes. The firm is best known for its exuberant commercial interiors, but Wilkinson has applied lessons from his own house to his first multifamily project, which was developed by C.O.Wood. Venice has become a petri dish for creative residential architecture, relegating Santa Monica to the sidelines. A strong sense of community conjoined with a lack of pretension has allowed architects to build there for themselves and others with a freedom denied elsewhere in LA. Folonis has enhanced the boardwalk with a row of ten spacious lofts divided by the Thornton Walk Street and set back to the sides behind Pamela Burton’s cactus garden. The site was zoned for 29 units, but developer NSB preferred to emphasize quality over quantity, and has reaped its reward. The cool white stucco facades, rising from a glazed retail base and a podium of parking, are animated by projecting hoods over the entries: a direct reference to the purity of early modernism. The seven ocean-facing units are oriented southwest and benefit from solar gain and good cross-ventilation. Each undivided, double-height unit has pocket sliding doors leading to a terrace, with stairs heading up to a mezzanine sleeping gallery and a rooftop terrace with a glazed lantern. Though the lofts resemble goldfish bowls from the boardwalk, there’s a high level of privacy behind the parapet and to the rear. The new galleries are designed to blend in with their bucolic surroundings. Flush with a private donation of $2.1 million, La Canada’s Descanso Gardens recently announced groundbreaking on the Sturt-Haaga Gallery of Art, a new LEED Silver certified art gallery and exhibition space meant to showcase both locally and nationally produced art in one of Los Angeles’ only public gardens. Funded entirely by Heather Sturt Haaga and Paul Haaga, Jr. of La Canada-Flintridge, whose donation is the largest in the history of Descanso, the 2,800-square-foot gallery complex will make use of an existing structure, once used as the garage for Descanso’s founder, E. Manchester Boddy. It will include several new structures designed by LA-based Frederick Fisher and Partners. An interior rendering of the galleries. The design includes two exhibition spaces to be created within the existing structure, and a new 1,300-square-foot gallery to be built into a hillside adjacent to the former garage. The design incorporates both vertical gardens and roof gardens to create visual connections between the new structure and its verdant setting in the 160-acre park. “We wanted to both respect the structure that was already there and yet add to it a structure of a level of quality that one would do from scratch,” Frederick Fisher said of his design. the plan includes the reuse of an old garage (Galleries A & B) and a new building (Gallery C). The mission, said David Brown, executive director of Descanso, will be to inspire a new appreciation of nature through visual arts. He added that the gallery plans to invite artists to come to the Gardens to exhibit their work in solo shows, group shows, and thematically-curated exhibitions.